Topsville has been instrumental in the development of many well-known private brands owned by key retailers. Topsville’s forte in the private brands business is working with major retailers such as Wal-Mart, Macy’s, Amazon, Lord & Taylor, Zulily, Bonton and many others, under nationally recognized brands such as: Epic Threads®, First Impressions®, Health Tex®, Jordache®, and Faded Glory® to name a few. 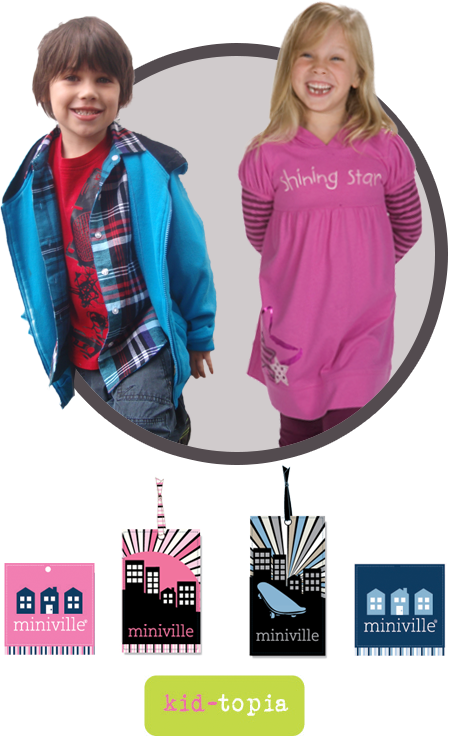 Topsville produces many of these brands in newborn through size 16 in girls and size 20 in boys. Besides the success in the private brands business , Topsville has also produced licensed product for many well-known names, such as Disney®, Thomas and Friends®, Wishes and Kisses®, Garanimals®, Charlie Rocket®, Happi by Dena® among others. Miniville and Kidtopia are two brands that are influencing the market in two very unique ways. Miniville is a lifestyle brand that integrates a lot of different fabrication into their designs. Their playful yet trendy spirit really differentiates their products from the rest. Kidtopia’s products are designed with moms and children in mind. They truly capture the essence of “easy wear – easy care” in every piece. This idea, combined with bold colors, is how Kidtopia creates a contemporary look that is age appropriate throughout their line.